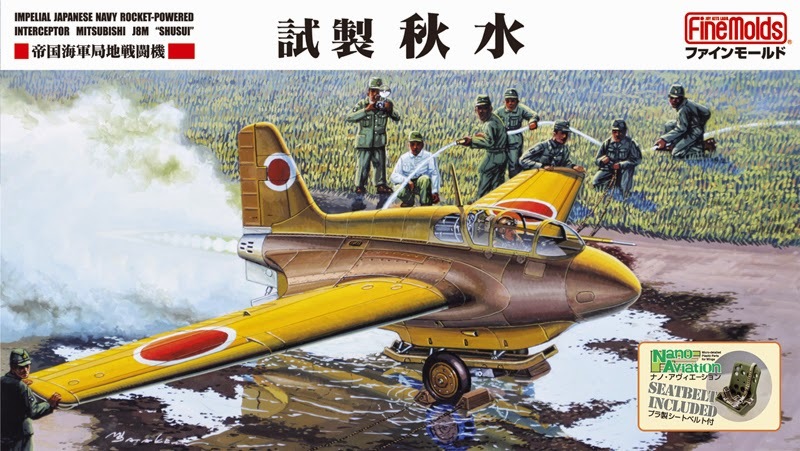 J8M Shusui rocket-based fighter at 1/72 scale. Mitsubishi J8M Shusui , which means Autumn Water, was a joint secret project of the Imperial Japanese Navy Air Service and Imperial Japanese Army Air Service. The Japanese learnt quickly from the devastation produced by B-29s bombers during their massive attacks to Germany. The Germans had developed the Messerschmitt Me 163 Komet, a rocket-powered fighter aircraft which was thought as the first interceptor of the history. Indeed, it was the first rocket-powered fighter aircraft ever to have been operational and the first piloted aircraft of any type to exceed 1000 km/h (621 mph) in level flight. 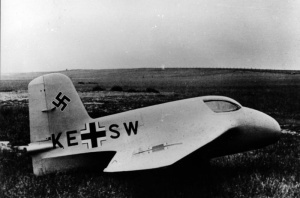 Me 163 AV4 prototype in late 1941. Source Bundesarchiv Bild 146-1972-058-62. The Japanese Navy negotiated the rights to licence-produce the aircraft and its Walter HWK 509A rocket engine and bought a license alone cost the Japanese 20 million Reichsmarks. Several aircrafts and engines were sent to Japan using submarines RO-501 (ex-U-1224) and I-29, however, they were both sunk before they reached Kobe. The later one could make the travel to Singapore, and one official of the navy could carry back to Japan a detailed manual with the design of the Komet. Because it was difficult to avoid the blockade of the US Navy by using submarines, they decided to build the prototype using the manual. On 8 January 1945, one of the two J8M1 prototypes was towed aloft, water ballast added in place of the fuel tank and rocket engine to test its aerodynamics. The test flights confirmed the design. Training courses for JAAF and JNAF pilots began on the Ku-53 glider, which shared a similar configuration to the J8M1. The 312th Naval Air Group was selected to operate the first J8M1. 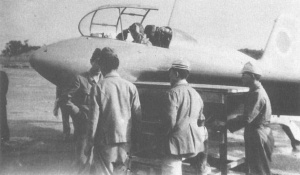 The first J8M1 prototype to be equipped with the Toko Ro.2 (KR10) was ready in June 1945. They were then transferred from the Nagoya plant to Yokoku for final checks before powered flight testing, after final glide tests with the engine installed. The J8M took her first powered flight on 7 July 1945 commanded by Lieutenant Commander Toyohiko Inuzuka at the controls. although it could take off the engine stopped abruptly and the aircraft crashed. The pilot also died in the accident. After the problem was detected and fixed, the sixth and seventh prototypes were to be fitted with the modified Ro.2 engine.Germany tried to send another Komet in U-864, but the submarine was sunk near Bergen by British submarine HMS Venturer in February 1945. 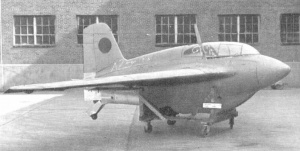 Mitsubishi J8M Shusui in 1945 ready for testing flight. In parallel, improved versions of the J8M had been developed. Indeed, the end of the war also meant he end of the JAAF’s Ki-202 Shusui-Kai (Modified Shusui). The new Ki-202 was to offer improved flight endurance over the Ki-200 and was aimed to the priority fighter for the JAAF in 1946, but no metal was cut before Japan’s surrender. The Ki-200 fighter was thought to be used in ramming attacks against B-29’s. In total, seven of the operational version (J8M1/Ki-200) were built by Mitsubishi. In principle, it was thought that there were two survivors. Two of them were taken to the United States for further evaluation and one is still exhibited at the Planes of Fame Museum in Chino, California. The second one, after some evaluation at NAS Glenview was scrapped. 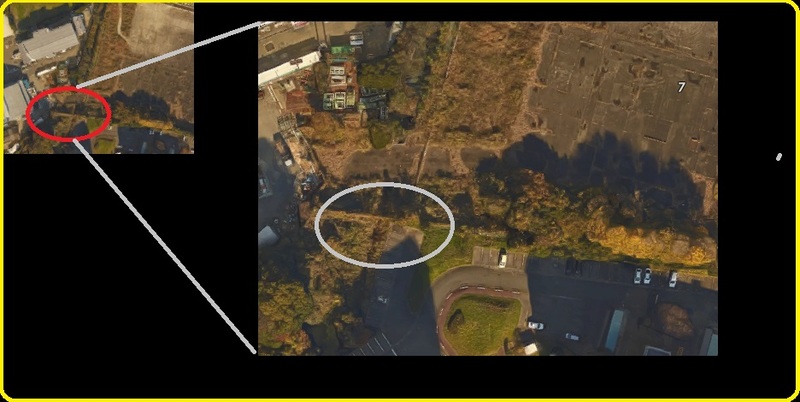 The most interesting discovery occurred, when in 1961 another survivor was discovered hidden in a cave in Japan, Kanazawa Ward, Yokohama, Kanagawa Prefecture. In 1961, another J8M was found in a secret cave with the fuselage almost intact.